Easy to install, Comes with Waterproof, Dustproof Caps. 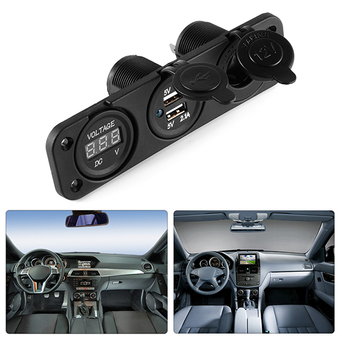 Voltmeter monitors your car battery and ensures its normal work. Dual USB ports allow charging two USB devices simultaneously. Blue LED Indicator, easy to find the USB ports and cigarette lighter in dark. Overall Size: Approx. 150 mm x 42mm x 55 mm / 5.90" x 1.65" x 2.16"